Structure My Deal tools are complete — you're ready to visit Carter Subaru Shoreline! *Limit one per coupon per visit. Must be presented at time of purchase. Cannot be combined with any other coupons or discounts. Valid at Carter Subaru only. As the summer heat persists, it's important to make sure your Subaru engine cooling system is ready for the road ahead. Fortunately, we're here to help in the parts department at Carter Subaru Shoreline. Show us this coupon, and you'll save 15% off the price of factory-approved Subaru engine coolant and an OEM thermostat. If your Subaru model is running a bit hot, there's a good chance that a new thermostat will solve the problem. What's more, this limited time special offer is a great chance to save on the things you need to keep your Subaru well maintained. We can't keep this do-it-yourself Subaru coolant system maintenance package priced this low for long, so grab this coupon and come see our friendly parts professionals today at Carter Subaru Shoreline, serving Everett and beyond. The entire Subaru lineup continues to earn industry recognition as the lowest cost to own vehicles in their class. In our parts department at Carter Subaru Shoreline, we're making do-it-yourself Subaru maintenance, service, and repair even easier with special offers like this one. Whether you're planning to spend some time in the garage taking care of the next oil change or it's that time of year to handle other maintenance, be sure to check out updated Subaru parts special offers like this one. If you'd rather leave your Subaru maintenance and service to the pros, expert factory-trained technicians are available in our Subaru service department. 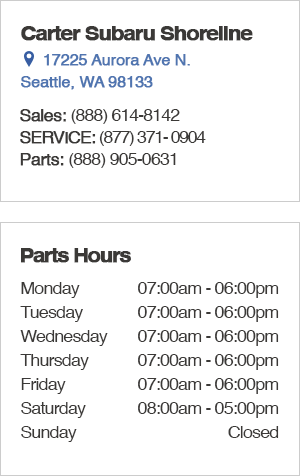 It's easy to order parts online, or simply come see us in person at 17225 Aurora Ave N., Seattle, WA 98133. Stop by for a visit today and discover what a hassle-free dealership is really about at Carter Subaru Shoreline, serving Lake Stevens and Mukilteo, WA.